Last week we were pleased to be joined by a work experience student from Marr Secondary School named Calum Beaton. With the pressure on to finish up our electrofishing for the season Calum was able to see first hand what is involved in our survey work. Willing and able, Calum was a pleasure to have on the team for the week and left on Friday with a better appreciation of what life at the Trust is like. With interests in physical geography Calum found many aspects of our work interesting. Calum takes a kick sample in what would have been a dry river channel back in June and July. 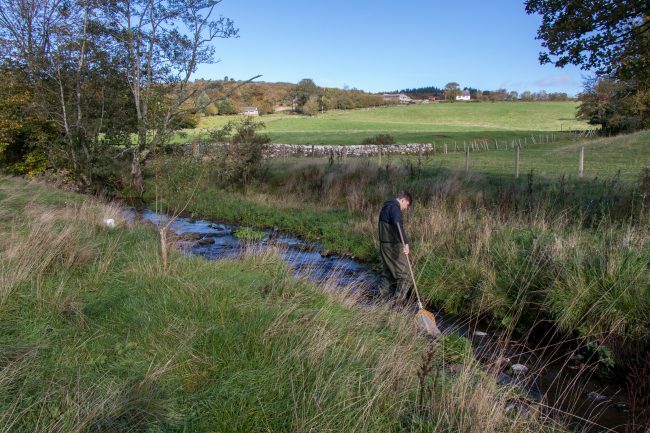 On Friday we visited the Culroy (tributary of the River Doon) to carry out some kick sampling (invertebrate samples) and monitor the bank stabilisation work we carried out over the last couple of years. With the upper Culroy all but denude of water in the summer there were little in the way of invertebrates remaining highlighting the requirement of trees to shade the burn. Previous cattle poaching had created an override channel which is now recovering following fencing. 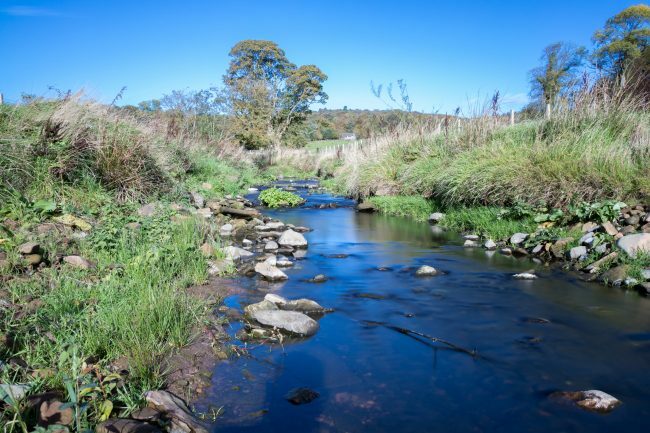 With trees planted (and thriving) over the site and livestock excluded, this site should develop into a robust, stable river channel capable of supporting juvenile fish. A shallow, override channel that is slowly gaining depth as it narrows. Damage is more quickly inflicted than it is remedied. Some of our willows and other tree species can be seen poking their heads up above the ground vegetation. The lower site just downstream of Culroy itself looks as if it faired rather better over the summer. With shade being provided by our willow weaving and a deeper channel we observed a range of invertebrates of different age classes. Our weaving is holding up well and as well as invertebrates I noticed a number of small fish moving amongst the cover afforded by the weaving. Friday was a bright, warm day and as this picture illustrates the willow is shading the burn from the midday sun. The foliage and roots are also providing fantastic fish and invertebrate cover. 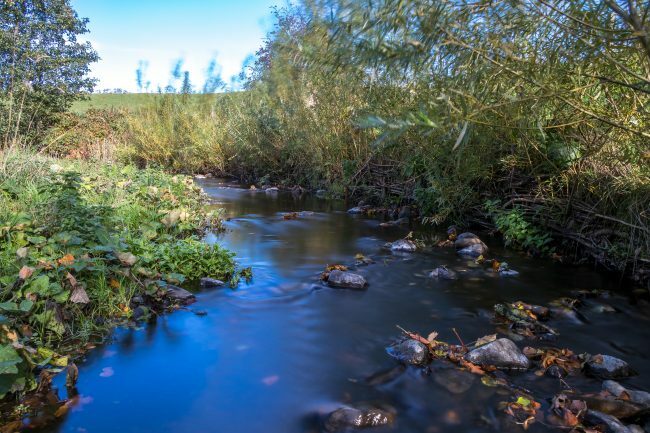 With lots of deep pots under the weaving there are plenty of areas for fish to find refuge in times of low water.